If you want to watch the Games in London and you don't have a ticket, or you need a meeting point before or after going to the Games, you're spoilt for choice with the number of venues on offer but all the places we've highlighted here offer something unique. During the Olympics you can soak up the atmosphere, watch the sporting action on big screens and party to top name DJs at the House of Nations in King's Cross, a pop-up bar and nightclub in a Grade II listed Art Deco venue. Situated directly opposite St. Pancras Renaissance Hotel, House of Nations is a good place to meet friends and colleagues if you're going to the Games and in need of a central meeting point before or after the Games. From here the Javelin train will whisk you from St Pancras International to Stratford International, the closest station to the Olympic Park, in just 7 minutes. There's food, drink, live sporting demonstrations and a chance to have your photo taken with the Olympic Torch. Meanwhile well known DJs including Sam Young (who plays at top London clubs Boujis and Chinawhite), Henry Relph (Big Chill House, Jalouse, Maya, Ministry Of Sound, Movida and Pacha London), and Ollie Humphreys (Punk Soho and China White) help to create a party atmosphere. Gold, silver and bronze packages are available for those who want to entertain clients. Pre-bought gold daily passes cost £75 + VAT (minimum booking of 10 guests) with food and drink included, silver guarantees day entry for £20 inc VAT and bronze tickets are available on the door, subject to availability. The party starts on the day of the Opening Ceremony, from 5pm-3am, with DJ Ollie Humphreys spinning the tunes. To book telephone 020 7378 2975 or email info@houseofnations.co.uk. If you don't have tickets to the Games but want to enjoy the world famous quadrennial sporting event in style you can see all the Olympic action from a unique venue in the moat of the Tower Of London. The House of Nations Tower of London is a marquee within the North Moat of one of London's most iconic visitor attractions. Ideally located for the 15,000 daily visitors to the Tower Of London and local office workers, The Pavilion at the Tower of London is close to both Tower Hill Tube and London Bridge Tube stations from where it's a direct train to Stratford and the Olympic Park. The venue can also be accessed by boat from Tower Millennium Pier. Open every day from 9am to 11pm from Friday 27th July to Sunday 12th August, and from 5pm to 3am for the Opening Ceremony on Friday 27th July, there are live sporting demonstrations, internationally inspired food, drinks and the chance to get your photo taken with the Olympic Torch. As with their sister venue at King's Cross, there are gold, silver and bronze packages available, aimed at those who want to entertain clients during the Olympics, with pre-bought gold daily passes costing £75 + VAT (minimum booking of 10 guests), food and drink included, silver guarantees day entry for £20 inc VAT and bronze tickets are available on the door, subject to availability. To book telephone 020 7378 2975 or email info@houseofnations.co.uk. A pop-up private members' club in a former Victorian stable in Swan Wharf, a 100-metre walk from the Olympic Park, The Fringe is the place to watch the Olympics in style with cocktail in hand. They're enlisting DJs like Norman Jay to take the party from day to night, with Philippe Stark chandeliers overhead and Tim Flach photos on the walls; this is a sophisticated place to enjoy the Olympics within javelin throwing distance of the Olympic Stadium. You can opt to arrive - and depart - in style, too, with private boats laid on to pick you up from central London and take you to The Fringe. If you really want to push the boat out you can hire the penthouse for a cool £50,000 a day, all food and drink included. But a much more reasonable £40 buys you night membership, from 7pm to 2am, with access to 5 bars, DJs and an outside courtyard with a video screen showing all of the Olympic action. Day membership, at £150, includes East London style street food, champagne and cocktails while watching the Olympics on big screens from the building overlooking the Olympic Stadium. Tickets are on sale now and the venue opens a week before the Opening Ceremony on 20th July remaining open until 9th September 2012. Legendary Soho jazz club Ronnie Scott's and Mayfair nightclub the Maddox Club exchange their regular homes for Forman's Fish Island for 17 nights during the Olympics. Guests can enjoy live performances from Ronnie Scott's All Stars every night from 10pm to 3am in the restaurant which is located just 100 metres from the Olympic Stadium within the Olympic Park. The Opening Ceremony party is set to be a special occasion with a live performance from MOBO nominated soul and jazz singer Natalie Williams who also runs and hosts the club's monthly soul night, Soul Family Sundays. If dancing to DJs and the latest club tunes is more your style Maddox Club is the place to be seen, occupying the Riviera part of Fish Island where you can relax on outdoor balconies face the stadium. While at Forman's you can also see an art exhibition, In the Rings with Ali, featuring photographs, memorabilia, audio and video installations, text and poetry in celebration of boxer Mohammad Ali who celebrated his 70th birthday this year. London Live Hyde Park will provide unparalleled coverage of the London Olympic Games via six giant screens, including the UK's largest at 144m sq. Then, each evening, the main screen will transform into an exceptional live music stage bringing headline performances to the masses. Every Olympic medal competed for at the Games will be broadcast on the large screens, giving Londoners the opportunity to come together and enjoy the once in a lifetime event in a festival-like atmosphere. In addition to the evening headline music performances from 5.30pm onwards, there will also be live music throughout the day in smaller, more intimate performance spaces as well as outdoor arts performances with performers from the London Outdoor Arts Festival. There will also be six specially created 'have a go' areas where those of all ages and abilities will be able to try out a range of sporting activities from handball and hockey to athletics and equestrian simulators. There will be two large-scale concerts on the 27th July and 12th August to mark the opening and closing ceremonies of the Games. All BT London Live dates except the Opening Celebration Concert and Closing Celebration Concert in Hyde Park are free and you can simply turn up on the day as long as capacity hasn't been reached. You can also book free Guaranteed Entry Tickets in advance for Hyde Park and Victoria Park which gives you access to the area as long as you arrive before 2pm. There are full details at www.btlondonlive.com, including how to register for tickets and information regarding the two other London Live events in Hyde Park and Trafalgar Square. London Live Victoria Park will provide coverage of the London Olympic Games via two giant screens, with the largest being 70m sq. Every Olympic medal competed for at the Games will be broadcast on the large screens, giving Londoners the opportunity to come together and enjoy the once in a lifetime event in a festival-like atmosphere. Plus, the al-fresco Sports Café provides a more intimate viewing experience. 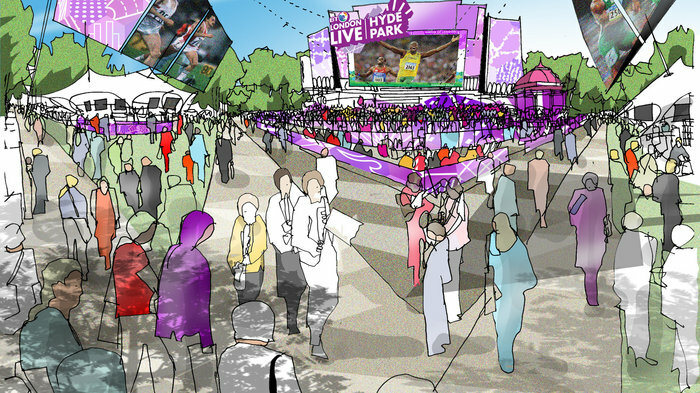 The Victoria Park segment of the capital-wide London Live series will also feature a Sports Park, offering a range of professional Olympic and Paralympic sports participation. And at the end of the day, there will be live music performances on the main stage, with two free performances nightly. The highlight will perhaps be the 40m high observation wheel, offering outstanding views of the Olympic Park and of the rest of London. And, inspired by a successful part of the 2010 Winter Games in Vancouver, there will also be a double zipline, offering riders the chance to zip down the two high-tension steel lines above Victoria Park's trees. There are full details at londonlive.uk.com, including how to register for tickets and information regarding the two other London Live events in Hyde Park and Trafalgar Square. Following the London Live events in Hyde Park and Victoria Park during the Olympics, BT London Live relocates to Trafalgar Square for the Paralympic Games for 12 days from 29th August, with sporting coverage from Channel 4 televised on a 60 metre square screen from 11am to 11.30pm daily. As well as screening all the Paralympic action from the Olympic Park, they will be showcasing live music with a concert planned each evening. There will also be the opportunity to try out a range of Paralympic sports whether you'd fit the criteria for qualification or not. Entry for BT London Live Trafalgar Square is available on a walk in, first-come, first-served basis, subject to capacity. There are full details at btlondonlive.com/trafalgar-square, including how to register for tickets and information on the two other BT London Live events during the Olympics in Hyde Park and Victoria Park. Head to Blackheath, close to the Olympic venue of Greenwich Park, to see all the sporting action on The Lewisham Big Screen from the Opening Ceremony on 27th July to the Closing Ceremony on 12th August 2012. The big screen, measuring 7.6m by 4.8m, is located within walking distance of equestrian events at Greenwich Park and will be showing live BBC coverage of the London 2012 Games. You won't just be watching the sports, there will be sporting activities you can take part in - try your hand at a variety of sports from netball to Nordic walking in the have-a-go sessions in the Sport Zone. There will also be a mirrored Spiegeltent with food, drink and further activities. There are family friendly days out too. Take the children (aged 3-12) to the Creative Emporium on Saturday 4th August where there's a craft market and children's craft workshops on kite making and creating your own Olympic torch (£4 per child, maximum 15 children per session). Another highlight comes on Tuesday 7th August when Trinity Laban Conservatoire of Music and Dance will be performing in the spectacular Spiegeltent, giving a contemporary dance performance and holding fun workshops as part of their Family Dance Live event. Watch the Games for free at Picture: Potters Fields where a big screen will be set up in the riverside park next to City Hall and Tower Bridge. Viewing all the sporting action from the Olympics is free on the big screen from 28th July to 12th August 2012. While there it's worth checking out the programme of performances at the nearby The Scoop at More London Free Festival which stages free open air theatre and street performances every summer. From 27th July, one of the official Games mascots, Mandeville or Wenlock, will be based at More London and will bring the Stroll Discovery Trails - of which there are six - to life. Put together by the Greater London Authority, the walking routes take visitors across the historic city centre, helping them to discover the sights and sounds of London. High up on the roof of Cannon Street Station the Cannon Bridge Roof Gardens is a wonderful setting from which to enjoy the opening and closing ceremonies of the Olympics. Impress clients with a party to remember within the picturesque surroundings of a British garden while enjoying spectacular views of iconic landmarks including Tower Bridge, St Paul's Cathedral and the recently completed Shard, the tallest building in the city. The two events, top and tailing the Olympics, have been organised by hospitality specialists Sportsworld who also look after corporate clients and sponsors at the Olympic Games themselves. Guests at this exclusive event will be treated to hot and cold canapes and BBQ from a top London event caterer, an open bar, live music, and the official Opening Ceremony on 27th July followed by the Closing Ceremony on 12th August with all the Olympic Stadium activities screened live from Stratford. Priced from £225 plus VAT with a minimum booking of 10 guests required, costs will be confirmed at the time of booking. Within one of the six east London host boroughs for the 2012 Games, Walthamstow rubs shoulders with the Olympic Park so it's a good place to watch BBC coverage of the sports on the Big Screen in Walthamstow Town Square - convenient for those staying at the nearby Camp in London. The local council are also putting on a whole host of free events. A week before the Opening Ceremony, on Saturday 21st July, Walthamstow Town Square marks the arrival of the Olympic flame with the Olympic Torch Relay Celebration including performances by Rizzle Kicks and local artists including hip-hop dance group UnityUK, dance act Twist and Pulse, vocalist Mizz Camara and free runners Rhythm Kour Collective. The Olympic Torch Relay Celebration is one of The Big 6, six free events Waltham Forest council is organising to celebrate the Olympic year which includes the Festival of Sport on 4th and 5th August where you can try a whole host of sporting activities at Waltham Forest Town Hall and Waltham Forest Pool and Track. The former Whitbread Brewery has a long history of entertaining Londoners (262 years to be precise). Now they reopen their historic doors for an exclusive 17 day festival during the Olympic Games, offering members access to six luxury escapes and a chance to enjoy the excitement of the sports in true British style. This pop up entertainment venue aims to provide city dwellers and visitors with a haven of tranquillity. The Retreat will feature six areas, all specially designed to fulfil whatever whim or desire may take your fancy. Get swept away from the urban grind in the peaceful park area. Feast on hearty British grub in the old school style diner. Indulge in a little sofa time in the vintage cinema (complete with popcorn, classic British movies and a state of the art supersized screen). Take stock of it all in the comfort of the Country Club, where traditional outdoor pursuits are enhanced by modern technologies. And as the cocktail hour quickly approaches, head to the nightclub for afterhours partying and live DJ sets courtesy of London nightclub Movida. Finally, restore a little serenity in the Backstage Theatre, a pampering station with on site beauty professionals. The fortnight long celebrations come with a bill of live music, performances and all the latest drama from the Olympic Games, which will be projected onto large screens throughout the venue. With easy access of the East London Olympic site, it's an extremely desirable place to indulge in a little play time, and the perfect place to do business in comfort. But expect to dig deep if you want a taste of this particular high life, full season tickets cost a cool 2,500 pounds, although they are transferable between multiple members, making this ideal for organisations looking for a luxury London hideout to use over the busy period. Run by SPACE, an art support group founded by Bridget Riley, Peter Sedgley and Peter Townsend in 1968, The White Building, is a cultural venue with six studios for practicing artists, a project room, event hire space as well as the Crate Brewery & Pizzeria, an artisan micro-brewery and pizza restaurant. Opened on 14th July 2012 with a ten-year lease, the Hackney Wick venue is part of the arts led strategy for the legacy of the Olympic Park. The 'creative lab' houses a mix of facilities and tenants, places to work, places to meet, places to eat intended to stimulate exciting creative innovation with a focus on the intersection of art, technology and sustainability. The refurbishment of The White Building, a former print warehouse by the canal overlooking the Olympic site, was designed by David Kohn Architects, in collaboration with Exploration Architecture, and was funded by the London Legacy Development Corporation. 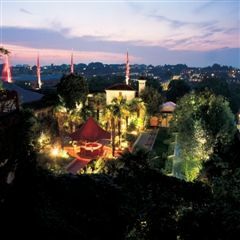 Enjoy the final evening of the Olympics in glorious style at Kensington's Roof Gardens. The Kensington Roof Gardens open up their sky-high club for an Olympic Closing Ceremony party that won't be forgotten in a hurry. The club night brings a fortnight of world-class sport in the capital to a close with live action from the official Olympic closing ceremony displayed on 15ft wide screens. Cocktails will be served on arrival before live DJ sets amp up the atmosphere. The 7th floor Babylon restaurant will be open from 7 - 10.30pm to keep the hungry clubbers well fueled (booking is advised). The entertainment continues until the early hours and will include a spectacular firework display set against one of the best views London has to offer. While this may be a celebration of sporting success, that doesn't mean trainers and tracksuits will cut it, the Roof Gardens dress code is simply "no effort, no entry." So be sure to book a ticket if you fancy partying 100 feet above the streets of London. Go for gold at The Book Club's Olympic themed adult playground. The Book Club will be turning the car park outside of their Shoreditch venue into a playground for adults this summer. Running for the duration of the Olympics, TBC Basecamp will be an alfresco pop-up featuring an outdoor bar, kitchen, games and big screens to watch all the Olympic action on. With an eccentric British theme, the playground will have everything a proud Britain could wish for - an ice cream van, table football, ping pong, a paddling pool and, of course, Pimms by the pint. Drinking is strongly encouraged as the bar will also be serving End It Like Beckham Cocktails, Mojitos, and lashings of cider and real ale. Following true Book Club style, entertainment will come in the form of live graffiti art set against a raw concrete backdrop. The fortnight's festivities will conclude with a closing party on the 12th August. The Ultimate Social Athletes party runs from 10am-10pm and will include team-based shenanigans such as beer pong, ping pong and tug-of-war. A forty day family festival screening all the action from the games. The Greenwich Summer Festival brings together live music, delicious food, alfresco film screenings, local brews and a diverse selection of cabaret and theatre. Plus, there's no need to worry about missing out on the action from the Games, their 15sqm Big Screen will ensure you don't miss a second. 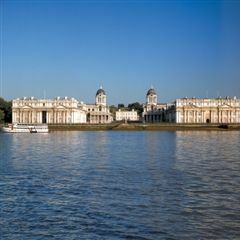 Entry to the Old Royal Naval College festival is totally free, but some shows are individually priced. The conclusion of the Olympic period is celebrated on August 12th with a full day of live sports screenings, music on the bandstand, Voltini's Victorian Sideshow, a film screening with live orchestra, and live coverage of the closing ceremony in all its great British glory. The forty day festival promises to be a kaleidoscope of culture that will give, "thousands of local residents and visitors a lasting memory of the Olympic Summer." From cheap budget places to stay to luxury 5 star suites see our special offers for hotels, including Hyatt Regency London The Churchill from 45% off.